Your property is made out of many moving parts. Having a working draining system is important to your property. Probably more important than you realize. If it has been a while since your gutters have been cleaned, it might be time to change that. When it is time to get those pipes draining, call for our Steinbach gutter cleaning service. When your sink or shower is blocked up, it is hard to think of anything else but your eavestrough is not as noticeable right off the bat. Some debris might not feel like a major issue but it adds up. Heavy debris such as dust, dirt and needles fall into the opened drainage system of your roof and sit. This foundation layer traps and collects new, lighter materials like leaves. As clogs become larger and larger, the system becomes impassable for water. This forces rainfall and snow melt to overflow, sitting on and softening the decking and materials near the eavestrough. This can lead to costly repairs and replacements or even pave the way for infestations. Between winter months and rainy seasons, there is a lot of moisture to contend with. With nowhere to go, this water can only sit, creating unnecessary wear and tear on your property. Wear: When gutters are impassable, water sits and debris sits inside, rotting and paving the way for bacteria growth. Blocked gutters also provide a damp, covered and cozy place for insects to call home.When you are in mosquito country, this can be a health risk. Insects large and small attracts rodents as well. Before you know it, your property is contending with mice, rats, or squirrels. Routine gutter cleaning can help prevent these unwanted visitors! Tear: The gutters around your property are designed for the quick transportation of rain water or snow melt. They are not equipped to accommodate the extra weight of sitting water, plant life, or the foot traffic from tiny paws. When faced with this extra weight, gutters can warp, bow or pull away from your property. 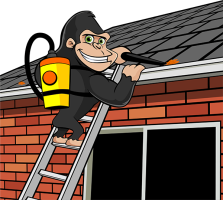 To ensure that we get the best possible results for your property, our Gorillas come prepared. By using high-powered vacuums, technicians ensure that every every leaf and needle is removed from your drainage system. Once we are confident that each and every gutter is clear, they are tested to ensure proper water flow. If you are curious as to just how much of a difference gutter cleaning makes, we can show you. Our Steinbach gutter cleaning comes complete with before and after photos that come right to you on the ground.